Checkbox has developed a technology platform that uses artificial intelligence and a 'drag and drop' interface allowing regulatory experts - like lawyers, accountants and analysts – to easily translate regulation into software without needing to write code. The ‘platform-as-a-service’ cloud solution also offers auditing, reporting and analytics features. In one case study, Checkbox helped one of the 'Big Four' advisory firms develop an online application to navigate the complexity of the International Financial Reporting Standards, converting a process that previously relied on over 50 Excel spreadsheets. 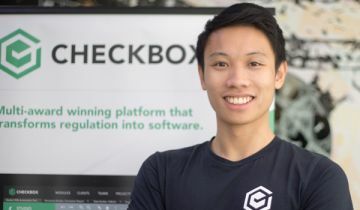 'Because Checkbox can build software without a developer, customers are able to rapidly prototype and react to regulatory changes,' Mr Wong said. 'We aim to deliver three key benefits: a dramatic increase in efficiency and productivity; the ability to use business applications created on the Checkbox platform as low-cost fee generators; and quality standardisation throughout an organisation that dramatically reduces the risk of human error. Checkbox will be featured at next week's ACCELERATERegTech2018 event, where Mr Wong will also be host of the PitchFest competition.